Pirates of the Caribbean is one of the few Disney attractions that actually came before and inspired the movie franchise. 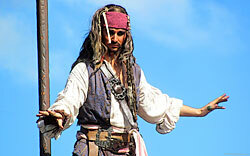 The ride has since been updated with Captain Jack Sparrow and other movie characters. Enjoy our Pirates of the Caribbean wallpaper!